Today’s post is the 17th entry in the #ArchiTalks series, a monthly writing event that Bob Borson of Life of an Architect (www.lifeofanarchitect.com) created back in July of 2014. The idea behind this series is to take a singular word of phrase and distribute it to a group of architectural bloggers, and let them take it in whatever direction they interpret. I don’t need much. I am a happy camper as long as I have my ….Canary Trace + Ultra-fine Sharpie + Prismacolor Red Carmine Pencils + 2B Pencils + Staedtler Mars erasers + a good computer with two monitors + a comfortable chair + latest software +++ and the list goes on and on and on about a few very basic tools of survival. A minimalist when it comes to everything else in life (Almost trying the capsule wardrobe), I am a hoarder of sorts with an array of writing, drawing and measuring tools, and a stack of reference books that vary from Building Codes to a ten year old Architecture magazine with something that I found inspiring. I store enough drafting supplies to last an apocalypse. Hard to pick one. So what is my “tool”? I spend the day glued to a screen even though I love my drafting supplies. “Proficient in AutoCAD”- that’s a line from my resume, and that line has kept me employed. The fact that I know my pencils has only translated into expressing my line-weights architecturally. I still sketch my ideas- whether I am revising a floor plan, or working on a construction detail. But mostly, it’s a CAD day. It’s been so for the past sixteen years. Probably not anymore. Recently I went from being a consultant to being a full-time employee. And it happens so, this is the last project we will do in CAD. I will be trained in Revit soon, and we will using Revit for most of our future projects though CAD will still be available for incidental use. Will Revit be my tool ultimately? Time will tell. Ultimately whatever it is will only be a program to convey my ideas. Pencil, AutoCAD or Revit – if it’s a 2-HR wall, it’s still a 2-HR wall irrespective of the color of the pencil or line weight. So, is the “ability to draw” my tool? To draw is to convey our idea to the client. To draw is to represent our intent to build. To draw is to communicate to the contractor. To draw is to convince the Bank that this project is feasible. To draw is to create something that engages generations to come. To draw is to uphold life and safety over all other things, and be approved by the authorities that are in-charge of life and safety. To draw is a responsibility. On a lighter note, tools an Architect always needs, but rarely talks about: A good stapler, an excellent staple remover, and an efficient carrier to shuttle the drawings to the City for submittals. We have all hurt a finger trying to use a screw driver in lieu of a good staple remover (OK, maybe not you, just me and others). Just a few months ago, I went to “slip sheet” at the City Office, and ruined my own stapler, and jammed the City’s stapler. They don’t deliver what they promise usually- so if you find a perfect one, hold on to it. Then there are hand trucks- always buy the one double the capacity of what you might need. They tilt, they go out of balance..Not funny when that happens. Super Bowl 50 ended. No more food and drink service for the day – and now comes the moment of clarity. Basic tool for my survival, my CHAIR! A couple of years ago, I became a Consultant, and started working from home. Without much thought to what I really wanted, I walked into Costco and picked up a chair that promised comfort, support and fit my budget. Thanks to the two year old who constantly stood on the base while I was sitting on the chair to keep her engaged with my hair, the chair broke in less than a year. Same story next year. After breaking three chairs in three years, now the daughter in school for the most of the day, and more money in the pocket thanks to the economy, I looked up for inspiration to “do” my home office. Almost all the posts I scanned, and the images I looked up had very uncomfortable looking chairs. 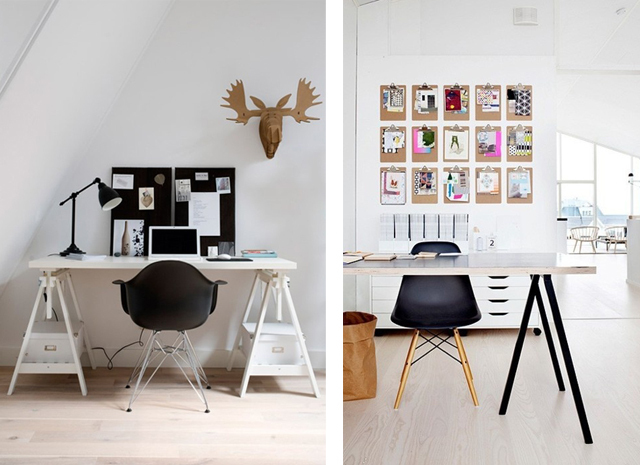 I don’t know how anyone could sit on an ” Eames Molded Wood Side Chair ” no matter how beautiful it looked. Another favorite among the bloggers was the wire chair. I know the wire chair- someone I know has wire chairs as dining rooms chairs. Without cushions. It’s a torture throne of sorts. Or maybe that was the intent to keep calorie intake low. I don’t know. But I couldn’t imagine sitting down for ten hours a day on such chairs, and not being able to move around my “L” desk comfortably. I bought Herman Miller’s SAYL chair. At $649, it was not affordable as the website suggests, but it was “within” reach. It’s been almost three years now, not a single creak and nothing broke. I rambled on. I know I did. But when you start a blog this late in the day, and try to catch up with every Super Bowl ad, and Half-time performances, it’s hard not to ramble. Next time, I will plan better. The “break” ends soon (tonight), and I will hit the books from tomorrow to get on path to Licensure. Hopefully with full time employment, kids and the puppy I will stay on track- thankfully I am surrounded by friends and family that do their best to keep me motivated. After all resilience is the biggest tool in anyone’s toolkit right next to ambition. It’s time, and it’s high time. Three fails in a line have broken my confidence, and I did want to forget the answers to all practice questions before hitting the books again. A fresh start can add better on previous knowledge than opening a book and groaning that I know all this and I don’t know how I failed..
Want to know what other Architects have in their tool kits? Check out the links below.. YES!!! A good stapler! Such a simple tool, one you take for granted until it breaks and fails to work! Also a big fan of the SAYL chair! YAY! Sayl is a very comfy and good looking chair..
Great post! Get back to those tests – I know you can do it! Thanks Lora! Will set up BDCS sometimes in March.. I bought this 60 sheet stapler a while back and I really like it.